No weapon formed against me shall prosper . I repeat “no weapon formed against me shall prosper and every tongue that is raised against me in judgment shall be condemed.” Can we take a moment to meditate on this? 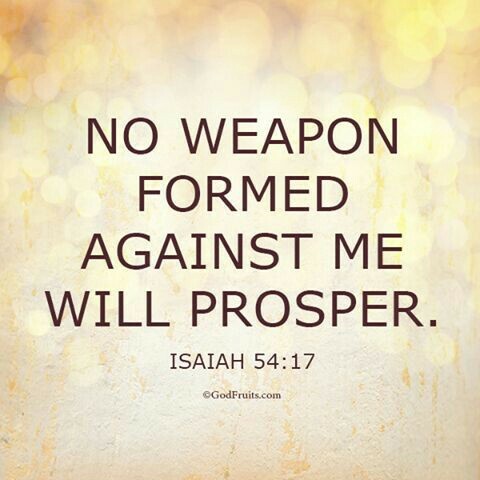 “No weapon formed against me shall prosper.” Whatever attacks of the enemy plotted against me will not defeat me. I will not be defeated . I will be strengthened, encouraged, motivated, redeemed, vindicated but I will NOT be defeated. These words reside in my heart tonight. If we are God’s people and God is with us and for us then the plots of the enemy cannot defeat us because we are redeemed by the Lord. God is bigger than any trial or tribulation in life. He has power and sovereignty over all the earth, galaxies and universe. God is all. If we are in God we are in all, we are one. The Lord is in control, even if things feel out of control or simply out of our control, trust in the Lord that He is in control and has all the control. Simply give your life over to the Lord and rest assured that in your times of need of trials and tribulations that the Lord guides you. The bible is full of so many promises. 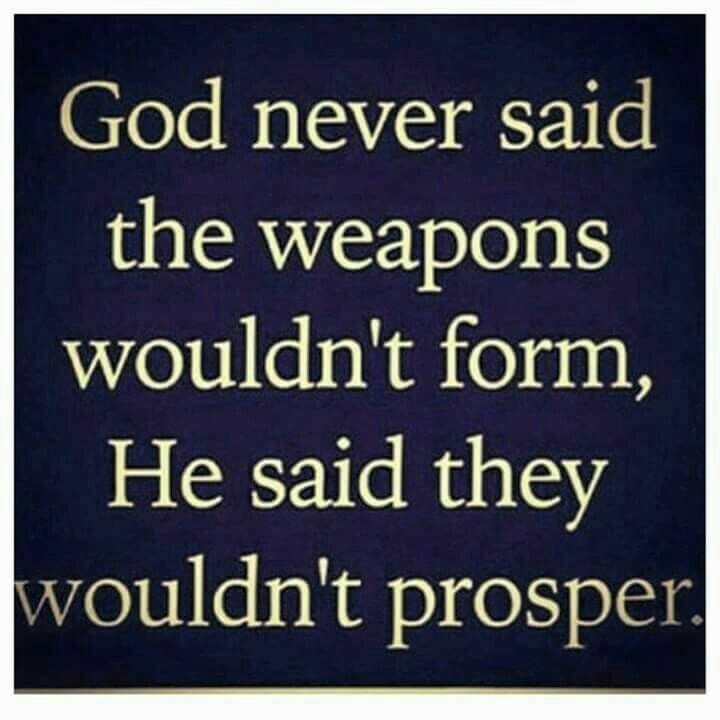 This is a promise that God gives to his people that no weapon formed against us shall prosper. For God stated “this is the heritage of the servants of the Lord.” God has plans for his servants. You are in God’s plans. This pain and suffering , this anguish that you feel is temporary . God is eternal. If the enemy tries to attack by provoking wounds or instilling anguish or setting up for pain just give it over to God. Simply say “God this is for you”. Often times we get caught up in the chaos of it all. The betrayal, the scandal, the anguish and we set our eyes on that and become disheartened, dissapointed, depressed and bitter but take heart because though the weapon may have formed it will NOT defeat you. It will not consume you. It will not prosper. It will NOT take the presence of God. God is bigger and more powerful and will fight your battles. 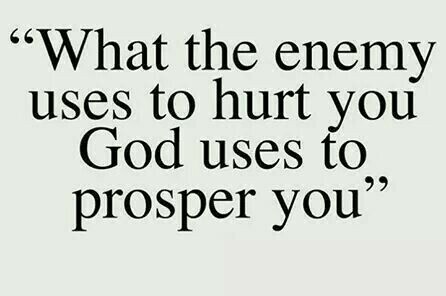 What the enemy uses to hurt you the Lord will use to prosper you. Believe it.God will prosper you not inspite of what has occurred but through what has occurred. The mess will become a message. The victim will become a victorer. And if we have no strength and feel weak as if we can’t go on it is then that the supernatural is imposed as we are made perfect in our weakness through God’s strength. Today I experienced a moment of truth. A new reality. A door bolted shut forever. And yet a window opened, a concrete sign that a solidified new beginning is occurring. A struggle that I do not own but had to enface. The harsh reality that in life there are individuals that are so narcissistic and deceiving that they will lie by omission to see if they can continue to manipulate. A moment in truth that will echo for all eternity. And to be quite honest a tactic that the enemy could use to make me feel the sting of rejection, the burn of abandonment. Though not a physical weapon, the spiritual weapon had been formed. One to cause hurt, anger, bitterness and pain but the Lord put in my heart “No weapon formed against me shall prosper”. I am his. I belong to him. He will not allow me to be defeated. God will use this in one of his mysterious ways to heal me. And so I share this piece as a reminder that when God’s presence is in your life it doesn’t matter what comes or what may because our lives are in God’s hands. If God’s presence is the greatest presence in your life then you will not be dismayed. God is good always. God is light. God is love and I am one. We should no that in the time of sickness, God is ever always by the side of HIS OWN, no matters whatever happens, Hill never loss His own.